VIRGINIA 46, Tennessee 38 - The Vols fresh off of a 37-36 loss to Georgetown bring the Cavs almost to a halt. 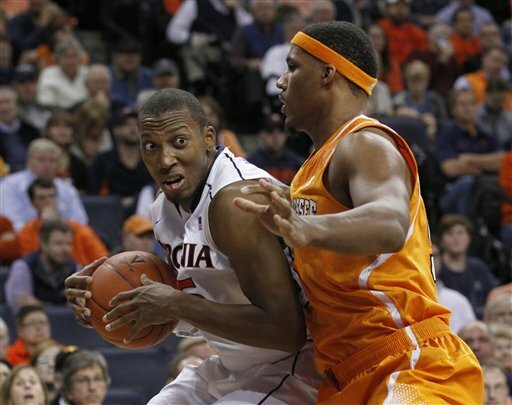 Akil Mitchell had 13 points and 12 rebounds, and Joe Harris also scored 13 as Virginia won a battle of stout defenses Wednesday night. The victory was the sixth in a row for the Cavaliers (7-2) and came after they limited the Vols to 28.8 percent shooting and just 15 field goals. Trae Golden scored 11 to lead Tennessee (4-3), which scored just 36 points in a one-point loss to No. 15 Georgetown on Friday and picked up where it left off. WAKE FOREST 71, High Point 60 - Chase Fischer came alive from behind the arc, knocking down five three-pointers for a career-high 15 points to lead Wake Forest to a 71-60 win over High Point on Wednesday at Joel Coliseum. The Demon Deacons (4-4) held a two-point lead at the halftime break but pulled away from the Panthers (4-4) in the second half thanks to a 50-percent second-half shooting mark, including 5-of-8 from three-point range. Joining Fischer in double figures were Tyler Cavanaugh, who finished with 11 points and five rebounds - both career highs, and Aaron Rountree III, who filled the stat sheet with 11 points, three steals, two assists and two blocks. Rountree, who went 4-for-4 from the field against the Panthers, has now made 10 of his last 11 field goals spanning the last three games. MARYLAND 100, UMES 68 - Logan Aronhalt scored 15 of his 17 points from beyond the arc, and Maryland breezed past winless Maryland-Eastern Shore Wednesday night for their seventh straight victory. Charles Mitchell had 10 points and 11 rebounds for the Terrapins (7-1), who had five players score in double figures. Alex Len contributed nine points, nine rebounds and two blocks in only 17 minutes. Playing the first of eight straight home games, Maryland improved 16-0 in this lopsided in-state series. The Terrapins shot 64 percent from the floor in building a 49-28 halftime lead. 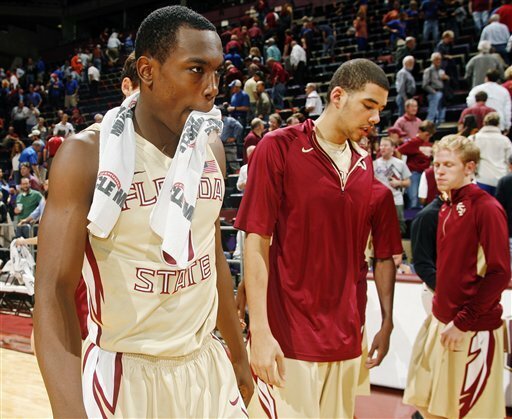 #5 Florida 72, FLORIDA STATE 47 - Focused on bouncing back in the wake of consecutive losses, the Florida State men's basketball team found an opponent in No. 5 Florida Wednesday night that was unwilling - and unrelenting - in its own quest to not let that happen. In a 72-47 loss to the Gators at the Donald L. Tucker Center, the same issue that has plagued FSU (4-4) through the early part of the 2012-13 reared its ugly head: the Seminoles simply couldn't get balanced production from its still-meshing group of key veterans and up-and-coming youngsters. That problem ultimately led to single-digit losses to South Alabama, Minnesota and Mercer already this year but upstart UF only exacerbated that issue with its depth, balance and size in the paint in the blowout victory.